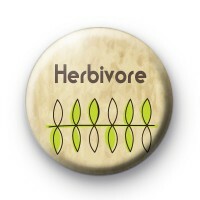 We have this epic Herbivore badge for fellow plant eaters. You do not need to eat meat to get your energy or protein. This herbivore button badge lets the world know that you are a Veggie/Vegan and do not eat animals. It is a light brown badge with a green leaf in the middle and the word Herbivore. It's a nice simple design. If you're plant-based and proud to be a member of the ever-growing Vegan community then this badge is perfect for you to wear. This is a great badge for any proud Vegan, or if you're taking part in Veganuary or just trying to make healthier more environmentally friendly food choices. With this badge pinned to your coat, it will be a great way to start conversations about Veganism.